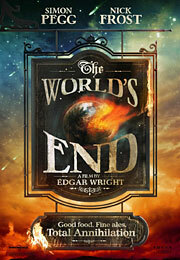 Much like their other films, “The World’s End” is one big homage to a particular genre (in this case, science fiction), and although it’s not as loaded with cheeky references, there are some pretty obvious influences at work, particularly “Invasion of the Body Snatchers” and “The Thing.” The sci-fi element doesn’t really kick in until about the midway point, however, and so early on, it plays out more like a “Big Chill”-style reunion movie, with Gary serving as the symbolic corpse that reunites the group of friends. And while Pegg and Frost are naturally the standouts of the cast (the former delivers what is arguably his best performance yet as the obnoxious man-child), this really is a group effort. Rosamund Pike admittedly gets short shrift as the only major female character in the film, but Considine, Freeman and Marsan are all given plenty to contribute, and the chemistry between the five actors is so good that some of the funniest scenes take place when they’re just sitting around talking. Sadly, the action sequences are pretty hit and miss, which is a shame considering Wright’s outstanding work in “Scott Pilgrim vs. the World.” Due to the robots’ main weakness, the action starts to get a bit monotonous, and there’s one particular set piece that, despite being really well staged, is ruined by a bizarre, sped-up quality (think “Benny Hill”) that doesn’t give you the chance to fully appreciate the intricacy of the choreography. Despite being known primarily as a comedic director, Wright’s unique visual style lends itself really well to action, and that’s certainly evident here, even if it feels like a step backwards from his previous accomplishments. The biggest sticking point for me is the sci-fi setting. In “Shaun of the Dead” and “Hot Fuzz,” the genre conventions not only worked in conjunction with the comedy, but thrived because of it, but here, they seem to be working against it, and that’s not just because the jokes flow fewer and farther between. There’s a greater sense of emotional weight due to the emphasis placed on character development, and as a result, it’s a much more grownup film than Wright and Pegg’s earlier collaborations, almost to a fault. Such comparisons may be unfair, but they were also inevitable, and although “The World’s End” isn’t as likely to become an instant classic as its predecessors, the movie is an incredibly fitting end to the trilogy that’s every bit as funny at times and still vastly better than a majority of Hollywood comedies.